I started this little series of posts as a sort of self-flagellation... you’re sitting up and paying attention now, right? I just thought it might be fun to try to highlight things that I really like which I feel you might not like at all. To defend the indefensible, to bare the very kernel of my middle-of-the-road soul. And, yeah, so far, it has been a laugh. Below is a Youtube video of a song. It’s a song from a show which has been held up a template of middle-of-the-road/yuppie pseudo artistic endeavour. A show which has been adored and pilloried in equal measure (I pillory it a lot). And this song is in it. The song is ‘Bring Him Home’ from the behemoth musical version of ‘Les Miserables’. I like this song, so you don’t have to. But it’s not just the song, it’s the singer. Colm Wilkinson is Irish and we’re all dead-proud of him ‘cos he went and made good on the international stage (no, not the one in Kilburn). This singer - singing this song - does something to me. What can I tell you? The little hairs rise on the nape of my neck and stay rizzed-up until the final astounding note is done. Here’s a curious thing. 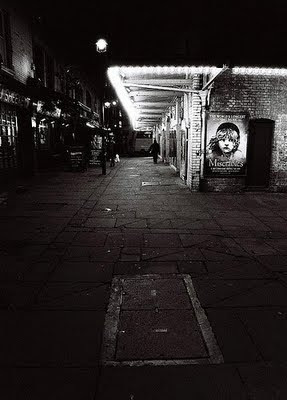 I went to see the show on Shaftesbury Avenue quite a few years ago… and I bloody hated it… and I still bloody hate it. One qualification: I liked the opening scene – the bare-naked revolving stage bit. That was brave and theatrical for a big show like that. But then it went all to hell in a hand basket with urchins and barricades and God knows what else. Hated it, grrrrrrrr. Doubtless someone sang this song the night we went to see it but it whooshed right over my head. I think I was so annoyed at all the money I’d spent getting in to see this dross that I was rendered totally impervious to anything good about it by the time the drunken innkeeper finally buggered off. It was years later that the song finally struck me. I remember it well. We were babysitting our nephews in Ballinrobe and the Late Late Show was on but I wasn’t paying much heed to it. Then Colm came on and sang this song live… and I stood transfixed in the centre of the floor and watched him. I literally could not believe what I heard. So what it is about the song? He sings it quite brilliantly, I think, but it can’t be just that, can it? Is it the sentiment that subconsciously tugs at the father in me? The elder’s plea for the life of the youth – 'take me instead'? There may be something in that – I have felt twinges of this before when reading ‘The Road’ or even watching ‘The Mist’, so I am obviously susceptible. Or is it just a stonking good tune? I don’t think it is actually, it’s okay but it's not brilliant. No, there’s more to it that that. Is it perhaps the vulnerability of a man adopting this emotional and moving falsetto? Does it touch the soul in some indefinable way? For me, at least, the song is definitely operating on some base level. I equate it to the moment when the head pops out of the boat in ‘Jaws’. Something made us jump then - and it was more than just the head and the fright. Something basic was touched upon. It's the same here. I like this song. So, go ahead, mock me as a fool. At least I stuck my neck out and I said it., right? I’m like Randall P McMurphy in the shower room… at least I tried, dammit, at least I tried. What are you brave enough to like? This is gorgeous..no shame should be involved in liking it.. It does it for me too. And I loved the whole musical, when it played in Melbourne some ten years ago. I've never seen this musical or indeed heard this song. Can't say it stirs me but I can see why it might stir others. It's interesting which songs from the shows stir up emotions for each of us. I always get tearful to 'Confidence in me' from 'The Sound of Music'! And there's the odd bit of 'Evita' I like too (though Covington versions only please). I'm going to go all esoteric here, but you did ask. I have mentioned several times on my blog how much I struggle with (a.k.a. hate) opera. And I do. Big time. And yet in my music collection you'll find a copy of Pierrot Lunaire by Arnold Schoenberg. I found a decent version on YouTube because all the words in the world can't really describe sprechstimme, the vocal style used by the soprano. Now why this wailing woman gets to me I have no idea but what I do remember is a televised version when the singer clambers around a giant climbing frame and for some reason I was utterly captivated by the whole thing and this song-cycle still reaches places that other vocal pieces can't. And I can't explain it. But odds are you'll hate it. As for Les Miserables, it was on TV sometime and I seem to recall watching some of it and wondering who the hell would pay to listen to it. It's probably one of those musicals you need to listen to several times for it to grow on you. Great set design mind. Colm has a lovely voice. I will be looking for other selections that he performs, that's how much I liked it. thanks for sharing. I LOVE this song! Like you, the first time I heard it, it gave me chills. At the time I wondered if it was due to the who and why of it being sung. A week after 9/11 a man sang it live on an American morning news show. [The Today Show]. He was a N.Y. City Policeman named Daniel Rodriguez with the most beautiful tenor voice. He went on to become an opera singer, which was his dream. I went to see Les Miserables last year after having previously been iffy about it, and then absolutely loved it. And cried quick a bit during it too (mostly to 'On My Own', but this one got tears too). Oh this cursed dial-up; I can't see YouTube videos anymore. I miss the high-speed too much these days! Yup, I was transfixed - I think that's the word - though I think more by him than the song. I'm going to have to hear it again. Maybe I'll get my revelation years down the road, same as you. This isn't the only song Colm sings that gives me tingles. (Listen to him sing 'Gethsemane' or 'Summertime'). But I think you're right about the vulnerability in the falsetto in this one. I've never heard anyone sing it as well as him, but then, it was written especially for him. The song is okay, but for me, wasn't the standout from Les Mis. Les Mis is my favorite musical (that's right, ahead of Phantom, and ahead of Mamma Mia!) I think the youtube version is okay, but seeing it live is when the chills run up and down my spine. To me, the showstopper and best song from Les Mis is "On My Own." It's one of the most original, poignant and poetic songs I've ever heard. "The End of the Day" is rousing and fun, "I Dreamed A Dream" is another highlight. "Drink with Me" has all the Nostalgia a fraternity or family reunion could ever hope for. But again, all these songs are best when performed and seen live. Anyone who liked the songs of the musical Les Miserables should be ready to make the step up to the even more beautiful songs -- of course, they call them arias -- of Wolfie Mozart. As for Les Miserables, did you see the sequel, MORE Miserables? Thank you all, thank you all for your comments on this. I've been a little distracted but I'm here, I'm here. Usually this level of distraction results in a substantial piece of completed writing so let's hope that's the case here too. Stick with me eh? This old place is very important to me and I ain't never giving it up. I've heard that song before, on TV as well. It is mesmerizing. Not what I would think of first in a list of my top songs. There are some songs, one by Anne Murray, which make me remember being really homesick for my Mother, my home, my country, that I still bawl when I hear it.